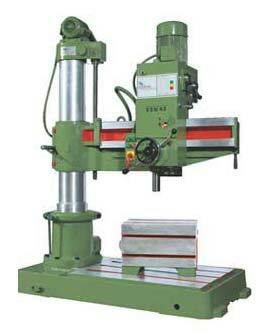 Siddhapura Enterprise manufactures, exports, and supplies Geared Radial Drilling Machine (Model No. SDM- 45). We would like to take this opportunity in introducing “SIDDHAPURA ENTERPRISE” (ISO 9001:2008 Certified Company), as one of the leading manufacturer of Radial & Pillar type Drilling Machine in Bhavnagar, Gujarat, INDIA. SIDDHAPURA ENTERPRISE is a leading global name in the drill industry. SIDDHAPURA ENTERPRISE aims at creation of wider industry platform in the manufacture of drilling machines in wider ranges in mutual benefit between supplier and buyer maintaining service, help and closer links. Main Base Plate, Coolant Tank is engulfed with equally scaled base plate and 'T' slot provided in base plate are duly machined. Leveled foundation of base plate includes bolts. Column so provided in base plate is single column which is grinded by WMW German make cylindrical grinder ensuring efficient as well as long lasting. Main Spindle made from alloy steel with 6 slots is machined by Hobber machine and MT Bore is provided internally grinded by internal grinding machine. All Components machines using jigs and fixtures on best mother machines to close tolerance thus providing easy interchangeability and best results as well. avoid accidents is provided including other parts as well wherever necessary.